Nature My Temple – Where Angels Fear to Tread? The Sentient Oracle has come about at a time in our Earth Sentience when there is a real need to acknowledge the existence of consciousness within all living Beings – Seen and Unseen. In the beautiful woodland setting of Aberfoyle, near to the Fairy Hill we will have an opportunity to spend some time in nature, communicating with Nature Spirits – trees, animals, birds, insects, and the “Unseen” world of Fairies, Elementals and Divas. The aim of the workshop at this Solstice point, is to make/enhance this communication and receive guidance through omens, signs or direct knowing for our own spiritual selves. It may concern a current issue in our life, or suggest a way forward for the next 6 months. We may wish to record our experience through writing or photography on the day. Lynn and Caireen will be available to discuss the mirrored photography that can reveal deeper into Nature, all of which can be done on a mobile phone. We will be working outdoors/full details and arrangements on booking. What does consciousness mean, what does it mean to be conscious of self? Do animals have a sense of self? Some certainly seem to have, and others seem to be developing a sense of self as a separate entity. Alongside this age old topic of contemplation of wonder, or fascination, is that of AI, artificial intelligence. Will AI ever develop a sense of itself? I can hardly think it wouldn’t as my understanding of Consciousness, is that there is that which remembers itself to be Consciousness and that which does not. That which remembers itself is always acting upon that which is does not. However, having said that, I am aware that my descriptive is linear, and Consciousness is not linear, nor can something really act upon itself, it just seems to do that at one level of reality. It is like asking What is not of Love? There is this or that, and anything that I determine is not of Love is therefore cast out of what I consider Love to be. This is purely an individual experience, and I reject and judge anything I consider unworthy or unlovable. I have simply created a separation in my mind, for All is Love, and there is nothing outside of that. Even the most horrific thing is Love when seen from an inclusive perspective. That doesn’t mean I like it, it only means I’m not in denial of what it is. It’s only when I stop resisting something does it lose its reality. This is of course a huge topic and one which I’m only using here as a little introduction into sharing a very short story on the topic of what is Consciousness. Once upon a time, there was a lady, a very kind lady who was exceptionally sensitive to the intelligences of other beings such as faeries, plants, rocks, water and other spirits of nature and all the elemental beings. She has the gift of hearing and understanding them, and they understand her too. She lived on an island in the Pacific, high up overlooking the sea. Her home was beautiful and she filled it with family treasures and those she collected on her travels. She also loved animals and plants and these were a source of much joy and fun for her – they were her company now as all of her natural human family had either passed or moved far away. She travelled a great deal, feeling the calling of the spirits of nature and ancient stories enticing her over to the Celtic Lands such as Scotland. Sometimes she was away for months at a time in her studies and nature immersions. Her house needed to be looked after when she was away, animals and plants all needed taking care of. On shorter trips someone called in daily and longer ones she had someone stay there. On shorter trips she would bring all her orchid plants into the kitchen for easy watering and care by a friend. She’d place them on a work surface on capillary matting which was watered and thus it required less attention. She was doing just that on one shorter holiday and had brought her beautiful orchids and placed them on the matting and was counting them to make sure she hadn’t forgotten any of them when her attention was caught by a strange, high pitched, very squeaky little sound. She listened. It was calling to her, “Me too, me too…don’t forget me!” She was confused, she was certain she had all her orchids there and what’s more, she didn’t recognise this very strange voice which was not at all like the voice or sounds that she usually associated with the orchid plants. Counting her plants she could find no one missing and still confused she went in search of the voice, honing in and allowing the sound to draw her towards it until she heard it quite clearly, very close to her and in her amazement, she saw not a real orchid at all, but an artificial one! Incredulous and not at all understanding how this could be, she talked with the voice and asked what it wanted. It was very simple; it wanted to go with the others! It didn’t want to be left alone and wanted only to be in company. As it told her this she remembered the reason she bought it was to keep another orchid company…this other orchid was in a place where orchids before had not really liked, so she got an artificial one rather than put a ‘live’ one there. It had worked quite well and the live orchid was in fact doing far better since she got the artificial one. With a sense of wonder and awe, she spoke Love to the orchid and gently carried and placed it with the others on the capillary matting. The End. And The Beginning. Everything wants to be real and is doing the best it possibly can. Every thing is of the One and has potential for life, for what is there but life? How can not life come from life? Each thing that is designed has a blueprint, and that blueprint is devoted to ensuring it reach its potential. A margarine carton wants to be the best margarine carton it can be. Another term for ‘blueprint’ is ‘guardian angel’ or in the case of plants, ‘deva’. It is this intelligence that whispers ‘grow’ to the plant. Dear Reader, thank you for visiting. This blog is a continuation of my story about journeys and experiences in France. The story has taken longer to write about than the actual time in France! This is because the story is actually woven into a very large part of my life and is evidence of how spirituality and awareness unfolds and expands in the living mystery school we call life … you can find all the parts on the France Pilgrimages menu tab. Peter and I had taken a long journey in many senses of the word to get here. There was a sense of home-coming and some relief at reaching Rennes-Les-Bains. We both had our own as well as shared memories and I think we were feeling the sense of the great wheel turning on being back here. For me it was bitter-sweet to be back here with the memories of exactly 3 years ago in 2014. So much of my life experiences are connected to this place; it seems that Rennes-Les-Bains is somehow acting like a pivot around which much has turned. We arrived mid evening and found our accommodation to be quite basic, or even a little grim in fact. It’s a small village and there seems to be a dearth of nice self-catering places to stay but never mind, it was in a great location only steps away from the main square and frankly, it was enough just to be here. Rennes-les-Bains is of course deep in the well-known mystery that surrounds the area and the village of Rennes-les-Château. For me though the area now is much more about the deeper mystery of the eternal feminine. We had booked 3 nights here and were looking forward to relaxing, travelling little and allowing things to organically unfold. I had a mystery to follow; that of discovering the source of the salty River Sals which runs through the area. 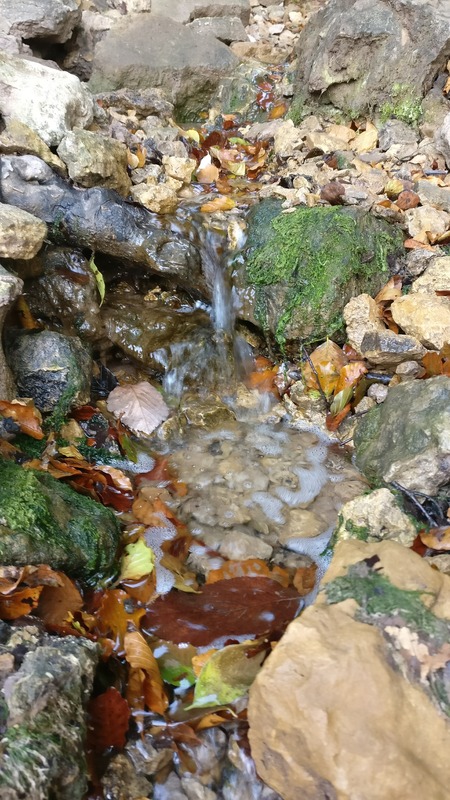 This river is where Magdalene was said to carry out baptisms, in the Fontaine d’amour (and you can see my photos from the 2014 retreat in the first part of this blog series). The subject of salt, and source, had come intuitively to me during the inner instruction I received about re-visiting France again in 2017. Though it was a rather sparse, vague intimation, I knew immediately that it was a deep and significant intimidation of many layers and felt too it was connected with the River Sals. Since I first became aware of the quote I wondered about it and it now rings so true for me for I know I lost much of my flavour over the past few years and this trip was working to restore it in a multi-dimensional way. This more recent salt/source intimation was somewhat ‘validated’ during a conversation I had with an acquaintance who guides people around the area and appeared to have made a similar connection. My agenda for Rennes-Les-Bains therefore was to find the source of the Sals! The next day was another beautiful sunny day and after a lazy morning we headed to the square. We ordered a pizza and beer and reminisced about the extraordinary coincidences of 2014 dining there with Taj and each spotting an acquaintance we knew, who were actually dining together! We were also chatting about the source of the Sals and doing some internet searching on the topic. I had just been talking to Peter about a friend Marie, whose house we almost stayed in 3 years ago, might know the location as her house was in Sougraine, the village just beyond Rennes and where the river would be sourced above. Though she no longer lived in the area I was about to message her and at that moment my attention was drawn to the sound of a car door shutting and I watched as a lovely woman jauntily moved down the street and into the square. Now I had only met Marie the once, but this looked very like her. I just stared as she passed, incredulous and yet not believing it could be her – I meant here are coincidences and synchronicities but really? Anyway, she passed me by without recognition and went into a house in the square…I sent the text anyway. Five minutes later, as I was watching the house in the corner she emerged without her sunglasses, I had also removed mine. There was no doubt now that it was Marie! As it usual in these serendipitous moments we were both delighted and somewhat awestruck, even slightly overwhelmed at the odds of it happening and we had a sweet, tearful reunion. She was only here for another hour and had been visiting her daughter in another village and popped into Rennes to see an old friend. Marie now lived in Berlin and had an hour before leaving to catch her flight back. Though she had no clue about the source of the river Sals, both Peter and I had at the moment Marie came over, simultaneously found the same site on the internet which gave precise directions to the source. Marie’s surname sounds like river (I won’t give the actual spelling to protect her identity) and of course, her first name is Mary. All this is what I nowadays refer to ‘resonance’ happening – I used to think of it as synchronicity until an experience a few years ago changed the way I interpret reality and I began to move from seeing events as cause and effect to seeing reality created through sympathetic vibrational resonance. (See this blog for more on resonance) When things/events became so inter-linked that I couldn’t make sense anymore about how such unlikely things could be happening, I had to find another explanation, as cause and effect were simply too limited to explain the reality I was experiencing. Once I began to see events through the eyes of resonance, it became a lot easier to understand how even the most outrageous of synchronicities and coincidences happen, and to some extent, it removed a large part of the mystery, some might say magic, of such experience. This is only part of the case as along with understanding of how we create reality comes peace. However there is no doubt that the ‘entertainment’ value of synchronicities, the fascination in them, starts to diminish once you see how resonance works in the creation of reality. It is true that the whole of the France trip itself including the planning and aftermath was an experience of resonance at work and this worked like a spiral, gradually becoming more obvious and powerful as we reached the centre, which was Rennes-les-Bains in 2017 just as it was for me in 2014. When I’m there it feels like I am in the centre point of a gravitational pull where the veil is so thin, where there is no time between cause and effect and simple imagining can makes things happen almost instantaneously. Like the blog authors we left the car at the bottom and hoofed it up; it was a lovely walk up beside the river through mountain pasture and I was grateful for the shade of the trees as it was still pretty hot plus I was tired from the journey and lack of sleeping well. We reached a car parking area and found a track up through the woods which opened out onto the clearing and here was the salty source which bubbles up from the ground. All my fatigue instantly vanished and I felt renewed just being here; I felt such joy, peace and comfort being here. I had a lightness of spirit and soul and I didn’t want to leave. I wanted to stay overnight, to camp out under the stars, and I wanted to bring others here to, just to simply be and soak up the energy of the place. We had fun there, like children exploring. We tasted the water and were so astonished at how incredibly salty it was! Apparently at times it can be twice as salty as the Mediterranean and I can easily believe that. We marvelled at how green the algae in the salty water was – how did it manage to grown in such a saline environment? We scrambled up to the source itself, bubbling magically out of the ground through rocks, coming down from Mt Bugarach (which is in itself known as a mysterious, sacred mountain.) A couple of tourists arrived and we had a brief and pleasant conversation with the older lady marvelling at the saltiness; I could tell she was similarly affected by the place. 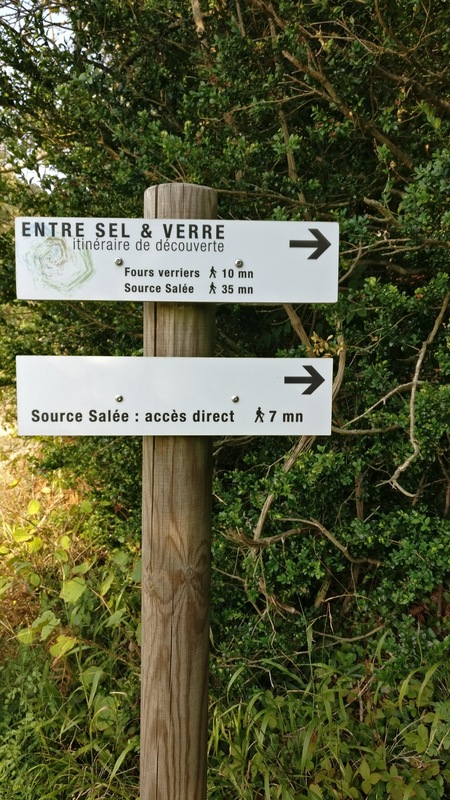 I bathed my feet in the super cold source and we explored the little huts where peasants evaporated water to obtain salt for selling…salt for sale (see how the words are connected here…) Sel-cell-salt-sell-self-sel(scot’s for self)-sale (Italian for salt) sel (French). In the months after France I have continued to meditate and research on salt and my understanding is expanding on this vast topic – I am now more interested and fascinated than ever to discover how incredibly significant this humble compound is no matter which level of interest is looked at. Today I came across the term ‘A Covenant of Salt’ which is found in the Old Testament 3 times. As I said, I am by no means a scholar on the bible, however over the years ‘knowings’ which have come to me are often to be found in the bible and I have learned that the truth is not restricted to one place or another, nor one book or another, but in a ‘both and’ way and not in an ‘either or’ manner. A Covenant of Salt is an eternal covenant; one which cannot be broken. This I sense refers not only to an agreement between people, and between people and God, but on a much deeper level, this is an agreement between us and our Source. Are we are a compound that cannot be unmade? Salt of the earth =truthful and with integrity. These are not just fanciful descriptions – they are facts of existence, and there is no choice in the matter – they are so. The attributes are not separate from the substance, so the substance must be that too. The next day autumn arrived early to the South of France. The weather was cooler but fine for a morning walk around the village to the red spring/source and Seat of Isis – I’ve little to report on that as it’s another well-known power point that I feel very little at and I went there to see if that had changed much, but it hadn’t and though I felt a deep sense of calm in the chair there isn’t much else to share. By afternoon it was raining with unusually cool temperatures of 15C. The weather stayed wet and cold like this for the next day too and we took the opportunity to rest a lot, sleep late, read, talk, cook for ourselves nourishing meals and importantly, give massages. I’ve mentioned previously that the giving of touch in the form of massage was an important aspect of this trip – though I’ve been in favour of touch and massage for many years now (including doing tantra massage professionally for 9 years) it wasn’t until this trip that I truly, deeply realised just how much it helps in the integration process, and this is of course especially if you’re the type who is in their head a lot, analysing and intellectualising the spiritual initiation and journeys of consciousness. I remember when Deborah Anapol and I were planning the first retreat to France that she said the Gnostic initiates were constantly massaged during certain initiations and this struck me at the time as being accurate and very interesting. I’ve since tried to find confirmation of this unsuccessfully. We were supposed to have a guided tour of the Cathar caves of initiation (the same caves I’ve still to write about the first experience in 2014) but our guide had to cancel at the last minute, this wasn’t so much disappointing as a little surprising as we’d only just spoken with him a some days previously to arrange it, plus we discovered our accommodation was only 2 houses away from where he was, so it all seemed to be aligned nicely. However it wasn’t to be and we decided we would try and find the caves ourselves, which we did and spent some time in the dark inside the complex of 7 caverns. We just stayed at the entrance to it and I confess I was afraid to go into a complex not knowing if I would get lost. Peter however had no such fear and next time he said he would go through the complex. Even that gives me cause for fear and I’d probably be worried about him not coming back out!! We then found the Bethlehem cave which is the cave of final initiation of the Cathar initiates. This is the cave that has the pentagram carved into the wall where in 2014 I got up into it but this time I was less fit and didn’t try it. Peter did very ably though and then later on he gave me more massage – what a guy. Situated in the Ariège River valley, Ussat-les-Bains, like Rennes-les-Bains, is also a thermal spa well known for its rich mineral water with curative properties. There’s another village joined to it called Ornaloc and the commune is referred to as Ornolac-Ussat-les-Bains. So the theme of water, springs, salt, mineral water, rivers, caves, nature was evident here too. From Ussat we headed west via Montsegur Castle which we only looked at from the road. We then headed to Nebias and spent a good couple of hours in the breathtakingly beautiful and mystical Labyrinthe Verte . Once again I had bitter-sweet memories as the previous time I’d been here was with my now ex-husband whilst staying at Monsegur however the beautiful sunny day, the company, both human and nature spirits, worked magic upon me and my mood lifted quickly. This place is deepest green nature, thick with nature spirits. It wasn’t until we were leaving that we realised that we’d gone through three distinctive levels or zones at this place, both physically and energetically. 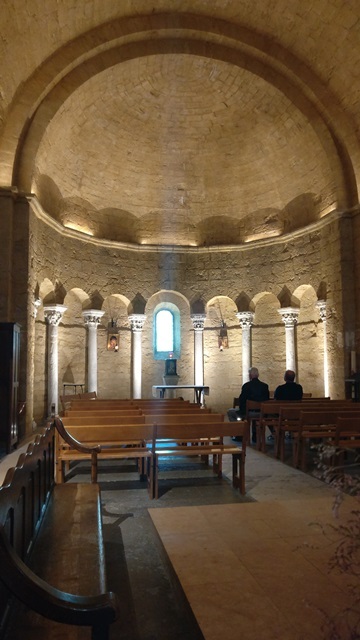 This mirrored our overall trip and also that of entering a cathedral building – through the entrance vestibule, then the nave and then the apse/altar. Some may also notice this is also echoing that of the triple goddess, with maiden, mother and crone. Or Virgin Mary, Mary Magdalene and Black Madonna/Virgin. For me this trinity ‘pattern’ was to come to life even more vividly during my final massage with Peter after we returned to his home in Paris. North east onto Sete that evening to stay with a dear friend of Peter’s for 2 nights. I’d thought about visiting Beziers or somewhere else but in Sete we had lovely weather gain and I was feeling I’d had quite enough of Cathar and deeply emotional/spiritual experiences! Instead we had delightful meals out and explored the town with Peter’s friend. I really appreciate the opportunity to have such amazing changes in scene and content – the variety is a balm to my soul. From Sete we headed a little north to Saint Maries de la Mer where we had lunch and visited the chapel. I had a profound experience which started on the beach as we arrived, remembrances of incredibly happy times though I’d not been there in this lifetime. I was highly energised. The chapel felt like home to me – I remembered it and the feeling of being there was deeply nurturing. I walked up the aisle like I owned it – so interesting to get that sense of complete and utter ‘rightness of being’. It is built on an underground spring which is visible from the chapel but not accessible, said to be the reason Mary Magdalene chose the spot to make home in. Yet another spring/source and by the time I had got this far, the theme of water, springs, source, salt was evident though not the meaning. There is also the famous salt – Fleur de Sel de Camargue from the area which is associated to Mary Magdalene by the pilgrims and seekers who come to this place. The energy/area of the Camargue is incredible and I find it hard to describe it – it definitely reminded me of Corsica, and there is indeed something very different about it, as if it were another country almost. Certainly it evoked or awakened cellular memory for me and touched me profoundly. I can feel it now in my body as I tune into the area as I write about it. 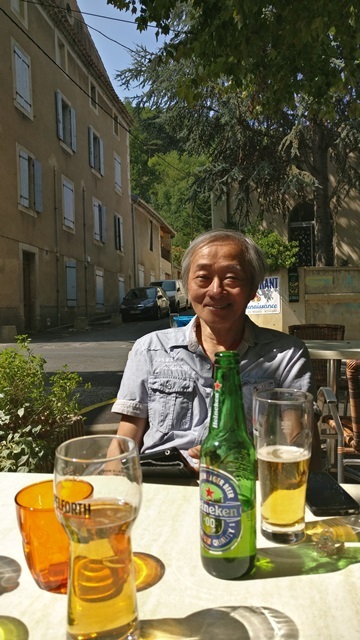 Our next stop was Aix en Province – this was unscheduled until we got to Rocamadour when Peter received a call from a lady connected to his friend in Sete; she was asking him about tantra massages for herself and a friend. Why not call in after Sete then? They were delighted and so she hosted us overnight in her beautiful home in Aix-en-Province. From Aix we headed north with an overnight stay in Vienne which is a town I felt resistance to once I was there, especially in the cathedral, though it was probably Peter’s favourite cathedral. Next day we head back to Paris which was a long drive and it was very good to get back home to Peter’s apartment. I’d like to finish here and leave the last part for another day because what happened to me during a final massage from Peter was one of the most extraordinary revelations of my life and gave me knowing (gnosis) on the nature of reality, religion, the Virgin Mary, Mary Magdalene, the Black Madonna and Nature herself. Peter and I met on Deborah (Taj) Anapol’s Pelvic Heart Integration training course in England in the summer of 2014 where we had an opportunity to work together during the week. Peter then came and visited me in Cork after my marriage broke up; his gentle presence and support were truly appreciated and it’s been that way ever since. Over time we’ve discussed many things and found a very nice meeting of minds which was growth inducing, we explore metaphysics and physics, health and body, touch, pleasure, Tantra, Taoism, sexuality, spirituality, good food, freedom and truth. We have enough similarities and enough differences to make it interesting. Peter is a physicist, and despite thinking I hated physics (old school stuff) until a few years ago, I have found that much of my mystical insights and experiences come through in a way that begs for clarity through physics. Running things past Peter has been an incredible gift to make sense of some of the more way out concepts that I access. I no longer hate physics though I still struggle to understand. For some years now Peter has been practising a remarkable tantric type massage and has more recently been developing a method of yoni touch known as yoni mapping and is receiving incredible feedback and results with the women he is working with. The underlying principle of Peter’s work that of pleasure: pleasure in giving and pleasure in receiving. He helps his clients revise any conditionality they carry that pleasure is bad and this creates an opportunity to let go of trauma held in the body and mind. When we open the door to accepting pleasure in the body as a fundamental right of being alive, not only may we rewrite our story and rewire our brain and body, we may also open the door to self-sovereignty too. He has developed effective blends of essential oils to assist with his work along with utilising crystal yoni eggs. I tell you this because massage, mapping and yoni forms a great deal of the experience I had in France when I returned there in September. Peter also joined Taj and I for our Initiation Retreat in 2014 and the three of us spent a good deal of time together. 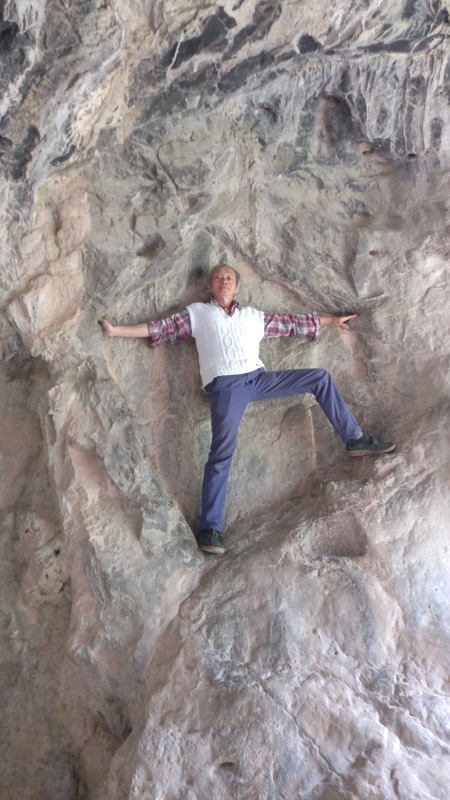 He was also in our intrepid Cathar Caves of Initiation outing group. It seems perfect that the cycle of the France Initiation retreat continues with the two of us and I’ll be sharing more about Peter’s work, our collaboration and our invitation to participate soon. I think it was in March 2017 when I got an inspiration to return to Rennes Les Bains and the South of France. It came at the same time I was at Bracklinn Falls (a phenomenal high energy place and waterfall in Central Scotland) when I was receiving inspiration from the nature and oak tree spirits to bring a small group to visit waterfalls and trees in the area. The France thing was almost like an afterthought, as in, yes, and go back to the south of France and take a group there. Visit the salty river. Salt is important. I also knew it was to be in the beginning of September*. Because the inspiration for France came through at the same time as NatureMyTemple I see them as both separate and entwined. A twin birth you might say. I felt more ready to launch NatureMyTemple and this took a lot of work (see blog) – the France trip felt out of my reach for a group – I just couldn’t see how I could take a group when I didn’t even know what I was taking them for. Despite feeling a new way of ‘doing’ groups which was basically not doing with having little or no structure. I just wasn’t able to move forward with it for France yet – it was all too soon for me to put a feeling into practise and I would require more experience to trust this new way. *It wasn’t until 2 days ago that I realised why it was that September was when I knew I must go to the South of France, not only in 2017 but also in 2014 with Taj and when I look back over the deepest experiences I’ve had in France, they have always been in early September. Astrologically speaking, 23 August and 22 September is the sign of Virgo, the Virgin. Here’s the symbol for Virgo. An M, for Maiden, or Mary, or Mother? Also looking very much like church architecture/arches. The additional bit on the right is supposed to represent a sheaf of wheat, but is also similar to the sign of a fish, as in the ichthys, Christos. Wherever you look, the same story is there. Kundalini can be utilised to raise vibration consciously. Once a certain vibration is reached, the information (truth) at that level is available to read, or is revealed. Like moving up and down the musical scales, different vibrational state can be accessed easily. Movement between them (like an elevator) is easily achieved. One floor is not necessarily better than another, once all are easily accessible by choice, one can move between at will and not get stuck in one place. It’s the getting stuck and not realising you can move, that is suffering. Once you realise you can move at will, suffering ceases, as does judgement and really, not floor is better or worse than another, they are just different, and preferences are fine to have. Sexual ecstasy can be used in the same way, as can nature, like waterfalls, which can give access to the Nature Spirit dimension. Getting stuck in lower states can be avoided, or if it happens, then there’s always someone there to remind you . This is the benefit of having a group to consort with. Food can be used – by omitting food of low vibration, one may access higher frequencies. Vibration however will not be sustained at this level because there is separation/judgement of ‘lower’ food, or energies. Transcendence is not lifting above, not going through. So, if there should be a time when vibration drops, and there will be because it’s not true higher vibe, but almost like artificially made higher state, then a crash will happen because there is still a frequency not embodied. By eating low/dense vibration food, and not judging it, one may bring consciousness to the lower states, thereby giving opportunity for growth and expansion to that state. Any judgement on anything will negate any chance that there is anything in that structure that may be utilised. All states exist in all humans at all times. The ‘key’ is remembering that one can travel or move between frequencies. Travelling to other locations horizontally (physical travel to locations on the planet) gives access to information and inter-action there too. Embodiment is helped by massage. Once one person accesses a frequency and embodies it, it is available to all at that level. Penetration of Matter by Spirit. It’s about matching frequency. You can travel ahead but you must circle around and collect the strays, the laggers-on and help them if you are one who can bridge the gap by having one foot in high and the other in low. Function – ascension. I realised that though food was mentioned, this was but one example of how we may judge activities or organisations, such as the banking and financial sector, or government etc. Name your favourite dislike! It was also understood that making anything a villain, or hero, would inevitably lead to it becoming the other. Don’t take sides – build a bridge between them instead. This is a time for collaboration. That the Cathars upheld each other comes across very clearly in that book, they looked out for each other and lifted each other when one was hurting, wounded, in pain. This is something we can do for each other, just by listening, chatting, being kind – it’s easy to help another like this and one feels lifted by the experience of doing so. If I am feeling low, then I must learn to reach out and let my dear ones know – and vice-versa. It doesn’t hurt or deplete me to allow love to flow through me if a dear one is feeling low. The key is the knowledge and awareness that it is possible to move between states of consciousness and that one is not ‘fixed’ in one place…this is also important when it comes to listening to a dear one in pain – they do not need to be fixed. It’s been just over three years since the yew incident in Devon which forms the main part for this blog, I’ve only recently felt to write about it. Before now, I never really seriously thought to put it into the written word and now that I have, I’ve really struggled in writing about it and it’s testing me in many ways. Days of starting and not getting anywhere, going off on tangents and realising that they’re not tangents and unable to cope with trying to get a very large map into a readable format. There are layers of meanings within meanings and always there is a deeper level of understanding to drop into. But how does one paint the whole universe? By realising that one cannot not paint the whole universe in the first stroke? At least not unless one trusts that in every word, in every space, in what is said, and not said, is like a hologram that contains the whole. And by just being content with the content so far… and realising that sometimes the perfection of writing is that it is imperfect, and unfinished. That hasn’t made it easier to write and I know now after struggling with it for weeks, that I am going through a deep initiation and learning as I write this piece. As I sit now writing this bit, I have just experienced a small panic attack and an intense urge to get up and do something else, anything to distract myself. I become quite agitated and get adrenaline rushes and hot flushes. I don’t know whether this is just about writing this particular piece or writing in general. Probably the two are not separate. I can only manage to write a few words, and a sentence or two takes more than 30 minutes! I think it’s partly because of the difficulties in either talking or writing without using a linear cause and effect model. I must write a poem about the experience of trying to write this stuff 😀 Certainly it would help if I could develop more of a sense of humour about it all – probably a good time for some laughter yoga! In writing this piece, I can actually see myself playing out on the micro scale the macrocosm of my life habits – the distraction, the focus on the little details like spelling, the seeming inability to trust the process, the constant allowing of interference, lack of focus, distraction by shiny things… the list goes on …and I’m betting all that sounds very familiar to a lot of people. I suspect that this is just the beginning, and that I will be writing about this and in general from now on. One of the incredibly difficulties I find in writing is in trying to describe things from an holistic experience, rather than cause and effect, or storytelling in a linear fashion. I don’t know where to start and how to describe all the various directions my experience takes me in. This is because that even if not at the time, I now experience life as simultaneous potential (resonance) and not just in terms of cause and effect and a single forward moving timeline. I mostly always write from my direct experiences and will sometimes include additional material to help to explain or expand my findings. Sometimes this acts like validation for me. Also, I write in this style to keep it as pure as possible, I do not wish to translate it into ‘givens’ or create more dogmas from my findings. The point of experience or the sharing of it, is not control and knowledge – it’s not so one can say, ‘well this is the truth, and now I’m happy because I know the unknowable’. Additionally, and interestingly, there are two very important things I’ve discovered during this process. 1) coffee is a shamanic plant medicine and can be engaged with as such. 2)My internal guidance telling me that ‘little and often’ is incredible wisdom for me, and not only does it work, it reveals so much more, and importantly, un-writes old unhelpful stuff and writes new neural pathways that have implications throughout my life. 3)I’ve forgotten what number 3 was. I’m doing some videos to introduce special energies and entities in and around Aberfoyle, Stirling, Scotland in connection with retreats and meditations I’m offering in my new work, NatureMyTemple. The first one is an introduction to a favourite nature tree character of mine in Aberfoyle, Stirling.